In-Q-Tel did not invest directly in Niantic. This made hide the influence of the intelligence community, but their hand this there. Early funding was provided by an venture capital firm called Alsop Louie Partners. Gilman Louie is a named partner in that firm and sits on the board of Niantic. He was formerly on the board of In-Q-Tel. He also directly advises the Senate Select Committee on Intelligence which is chaired by war profiteer Dianne Feinstein. He has also been directly given awards for his service by the CIA. If he is involved it is because the intelligence community wants something done. 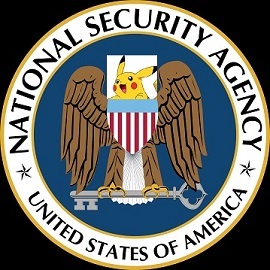 There are many ways for the NSA to read your email without Pokemoning their way into your cell phone. So what is the point? Why did the intelligence community spend money to make a game? The NSA has been known to scan the chat logs of World of Warcraft players, but making a game seems to be going a bit far beyond the ridiculus distance they have already gone. All the dialogue around the intelligence community and the game by media outlets, Gawker and Boing Boing seem to be missing the point. The business model runs on microtransactions, which makes everything that happens in game a business record thus automatically open to seizure under the Patriot Act whether Niantic or Google or Ninetendo or you like it or not. Contextualizing this further means that every pixel from every camera phone playing that game is now the property of Uncle Sam. This is a very rich data set. Because it is cellularly located, and tied to your phone number, credit card, email and social media, they know who and where you are and what you are looking at. The biometric scanning built into police body cameras pales in comparison. Pokemon Go attracts groups of people to locations, identifies them with rich metadata and gets them to attach biometric scanning to that metadata. Further, it gets them to do it at their own expense in both money and labor. We participate in our own surveillance. It's like Google glass on acid. Like Hanke's Keyhole turned Google Earth product, it is building a database of what the whole world looks like. Pokemon spawn inside buildings. They spawn inside houses. We are now mapping our own houses for the same guy who invented Google Earth. A sweep around the room reveals my bookshelf. Should I be playing this game, I've given the government a picture of the books I own. Is one open on the table? Now they know what I'm currently reading. Are there posters on the wall? Now they know what bands and movies I like. Did I have friends over? Now they are bio-metrically scanned and tagged with dates and times, forever linked with me and each other in a government database. The genius of Pokemon Go that people are missing is that we are paying to create a database that would be prohibitvely expensive to make any other way. The intelligence community is making a profit off tricking us into spying on ourselves and we are running ourselves ragged doing it. So if you are looking for that special Pokemon something or other, please stay the hell out of my yard.